On July 13, Indivisible Houston and concerned people of Pasadena pushed back on the concept of Broken Window Theory policing at a meeting held by the Pasadena Police Department, challenging the broken theory as discriminatory toward those with less resources, particularly in black and brown communities. The meeting outlined a long series of “broken window” ordinance violations and encouraged neighbors to call the police over minor violations. The meeting also made clear that community policing may be a theme in Pasadena policy discussions, but there is not a truly widespread community policing program in place in Pasadena. There are not individual community police for given neighborhoods, and most community programs were based on surveillance measures rather than pro-social measures. Several of the measures depended on major class divides that lead to further racial division and discriminatory policing. Given the case of #JohnHernandez and other issues in the area, The People of Pasadena and the representatives from the area should address the issue. Sylvia R Garcia, State Representative Carol Alvarado, Gene Green and the city council and mayor’s office in Pasadena should all be held accountable for what comes of this and uphold policies that allow all communities to thrive. “Broken Windows Theory” was introduced by social scientists James Q. Wilson and George Kelling in a 1982 issue of Atlantic Monthly. Broken windows were chosen as a metaphor for a pervasive sense of disorder within a given community. The idea is that if people see graffiti, litter, and derelict buildings, they will get a sense that no one is in control and that police do not have authority in the community. Wilson and Kelling argued that maintaining order by enforcing penalties for minor crimes prevents more serious crime. In the graffiti-ridden days of New York City, residents might have felt like no one was in charge. Times Square was a nexus of peep shows and prostitution. Violent crime waves were gripping the city. The NYPD and FDNY even released a pamphlet warning tourists to stay away from NYC. The vigilante film “Death Wish” acted out a sentiment washing over many New Yorkers—the city is out of control and someone needs to pay. The NYPD turned to Broken Windows Theory as an answer to the city’s pervasive sense of lawlessness. Much like police work itself, what could have become a force of community improvement became a slippery slope to racial profiling and police brutality. Instead of partnering with affected communities, the NYPD began targeting disenfranchised communities of color. In the 1990s, on the heels of the wrongful convictions of the Central Park Five, New York City Police Commissioner William Bratton chose to interpret Broken Windows Theory as carte blanche for aggressive enforcement and mass incarceration for minor infractions, such as selling loose cigarettes. 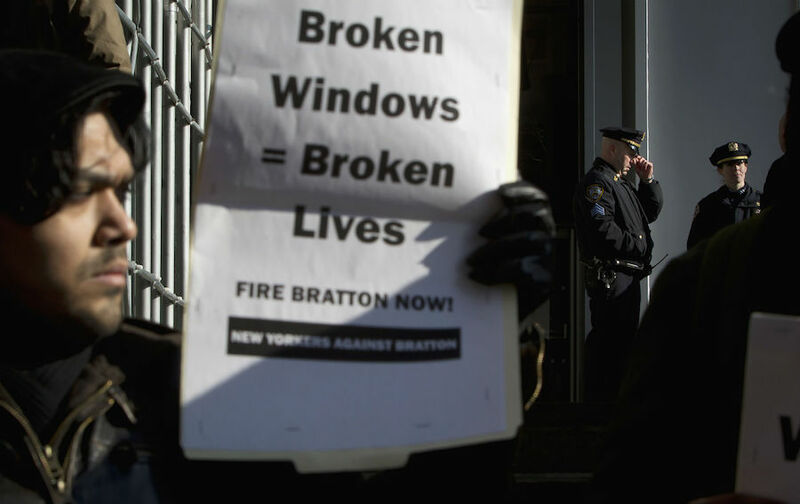 A direct line can be traced from Bratton’s interpretation of Broken Windows theory to the 2014 death of Eric Garner, who was put in a chokehold by the NYPD for selling loose cigarettes. Bratton had created a culture of racism within the NYPD, which continued to fester under Commissioner Ray Kelly. “Broken windows” had become euphemistic code for ruining and ending black and brown lives. Critics of the theory argue that it’s neoconservative pseudoscience (Kelling is in fact a criminology research professor at Manhattan Institute, a conservative think tank at Rutgers University). Aside from an apparently inherent bias, there is no scientific proof that Broken Windows policing actually reduces crime. Even Kelling believes Broken Windows Theory has been misapplied. Lately, we have seen a rash of white people calling the cops on people of color for things like having a BBQ in a park, waiting for a friend in a Starbucks, leaving an AirBnB, napping in a common room, and selling water on a hot day. It’s easy to see a correlation between Broken Windows policy and the pervasive sense of entitlement that leads some white people to think they can call the cops on people of color without reason and without consequences. Activists are calling for a fine to be imposed on racially-motivated 911 calls in order to abate the rash of Permit Patties and Barbecue Betties. These aren’t just funny memes of white people overreacting to people living while black. When the wrong cops show up, no matter how minor the “offense”—if there even is an offense committed at all—potential escalation could end a life. As we argued at the July 13 meeting, community policing is shown to reduce crime and build trust between the community and police force through familiarity. Thanks in large part to community policing, the city of Cincinnati has simultaneously reduced crime while also reducing the number of arrests. President Obama’s Task Force on 21st Century Policing released a report in 2015 that suggested incorporating the community policing approach in cities across the nation based on Cincinnati’s promising results. Pasadena and the City of Houston could be doing more to protect and partner with communities of color, and we think the first step is to part ways with the broken theory of Broken Windows. Now is the time to take a stand against the racial profiling and targeting that results from this harmful theory. Indivisible Houston encourages Pasadena residents to contact the mayor and their city council member to push back against the implementation of harmful Broken Windows Policing in favor of pro-social programs. Demand the city discourage NextDoor and Facebook surveillance in favor of pro-social assistance, community policing that designates individual police to specific neighborhoods where they have skin in the game, and more an independent oversight committee that truly bridges the gap between police and Pasadena residents. All contact info is below. If you do not live in Pasadena, it is still worth it for you to open this dialogue in your community. You can also tweet at the Pasadena Police Department and the City of Pasadena. NOTE: District A councilmember Felipe Villareal, District C councilmember Don Harrison, and District D councilmember Sammy Casado all currently have blank info pages on the Pasadena, Texas website. District G councilmember Cary Bass has a bio but no contact info. We have presumed their emails match the Pasadena City Council format. To reach these reps by phone, call the City of Pasadena general line at (713) 477-1511 and request a transfer. Special thanks to BLM Houston and Daniel Cohen for contributions to this piece.